As Pulaukotok’s headquarters were relocating to Oakland in late 2015, a group of designers were a few miles away planning the magazine’s 2016 Idea House. 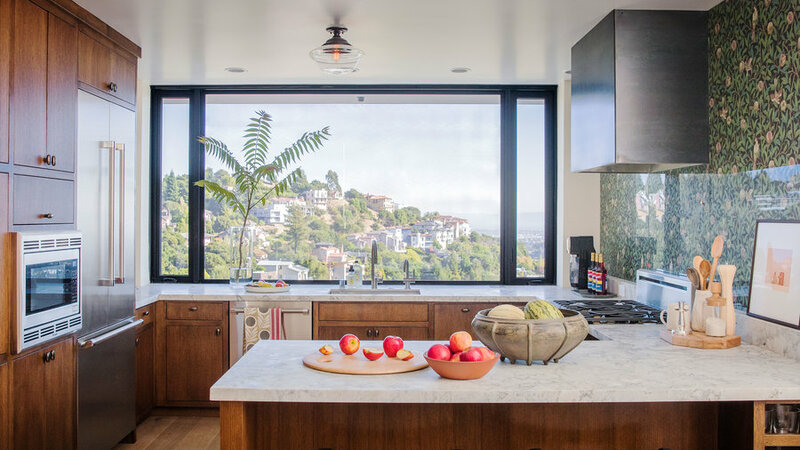 Perched in the Claremont Hills bordering Oakland and Berkeley, the home was conceived as a tribute to the Bay Area—its architecture, its quirky character, its spirit of innovation. 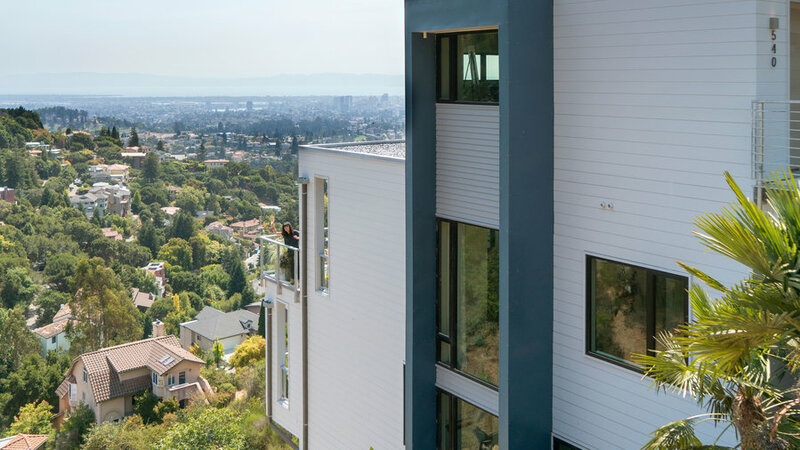 Facilitated by DFI Properties and Keith Kolker of Landmark Development, architect Robert Nebolon created a five-level, 3,600-square-foot cantilevered home clad in James Hardie siding. 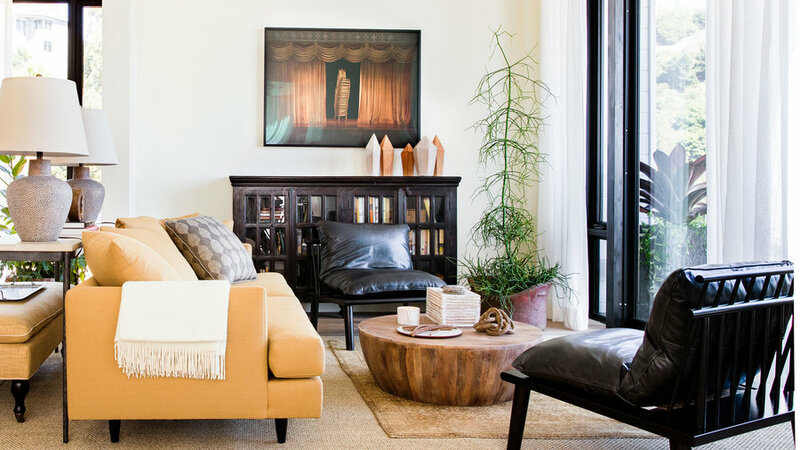 To warm up the modern shell, interior designer Lauren Geremia and her team, Emily Ord and Erin O’Brien, mixed furnishings and paint with vintage items and statement-making pieces by Western artists. The result is a home that feels like a retreat—and offers design ideas around every corner. 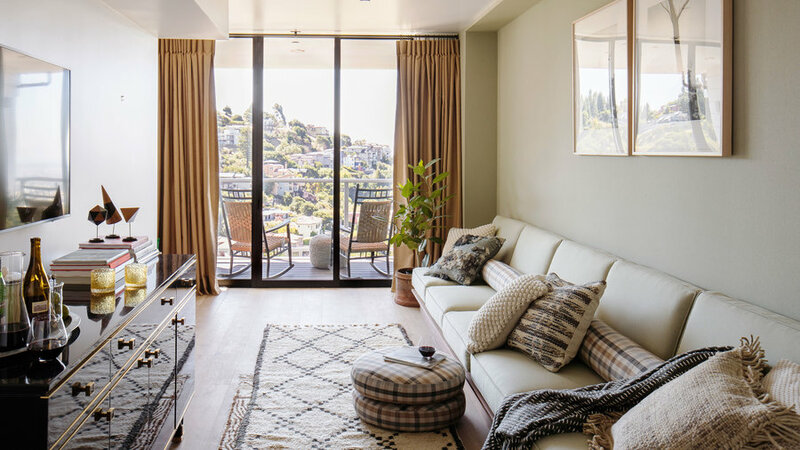 Lauren Geremia designed the living room around the vistas, from the furniture arrangement to the soft golden palette. Crowd for Pleaser sofa, $2,100. for Matunuck lounge chairs, $4,600. for: Safavieh Hampton Pillow Top bench, $371; Arteriors Home Jacob cocktail table, $1,650; MOTI Michigan glass cabinet, $1,348; Interlude Brighton console, $855; Safavieh natural area fiber rug (bottom), from $47. for accessories. for Sivas rug. for Bentley Brown Leaf Hammered Pot table lamps, $80 each. for Balancing Act C-Print by Tammy Rae Carland. for Designers Guild Glenmore linen. 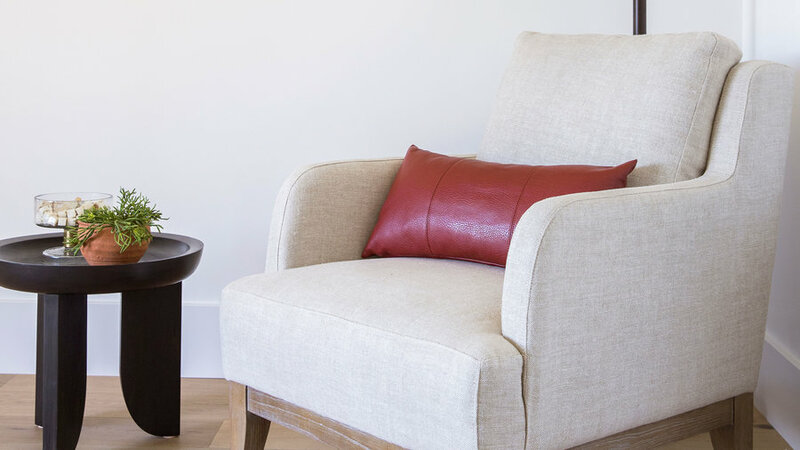 The design team turned an easy-to-overlook part of the living room into a reading nook. To do the same at home, pair a small table with a piece of furniture that can hold its own. 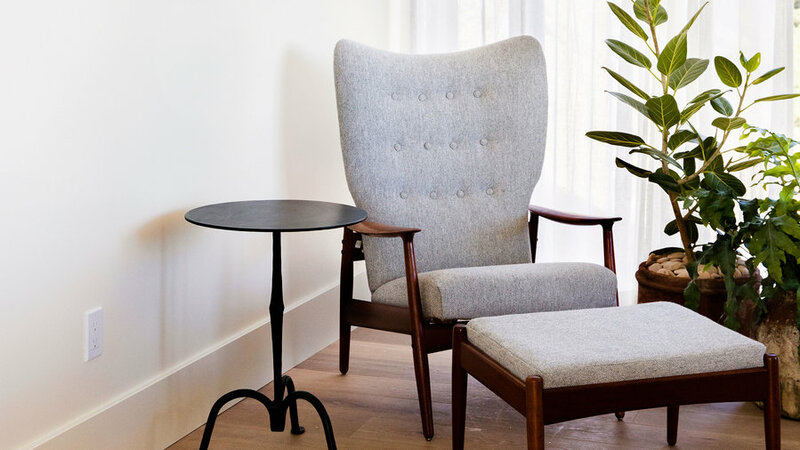 This vintage chair has a strong shape, but is comfortable enough for long reads. for Midcentury Danish wingback chair. 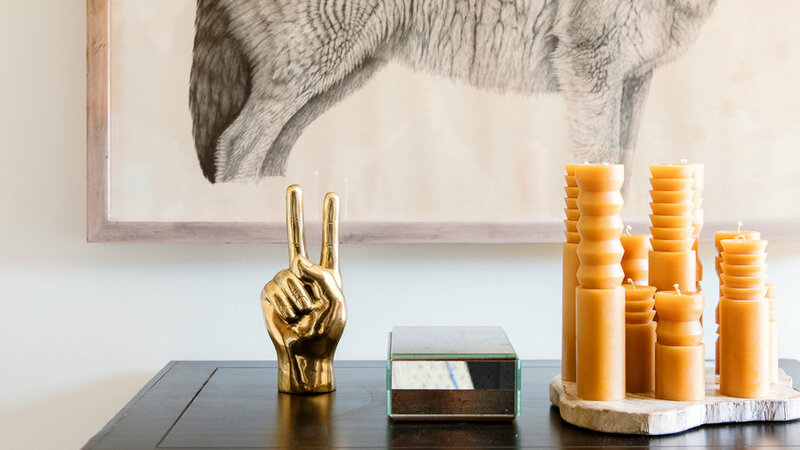 , , , , and are Lauren Geremia Design's favorite sources for vintage pieces that are one click away. 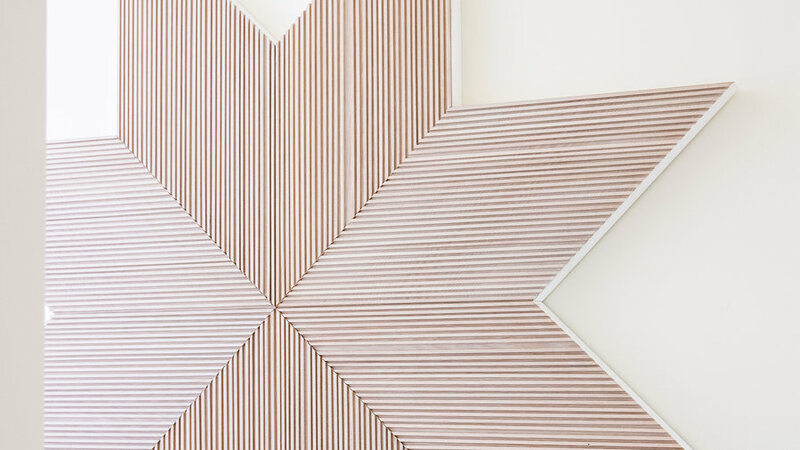 “We wanted to take risks with the wall treatments in this house,” says Geremia. In the kitchen, for instance, she applied an Arts and Crafts wallpaper in place of tile to the wall, adding an unexpected burst of pattern. The wallpaper was treated with a Scotchguard-like coating and is covered with tempered glass to protect against water damage. 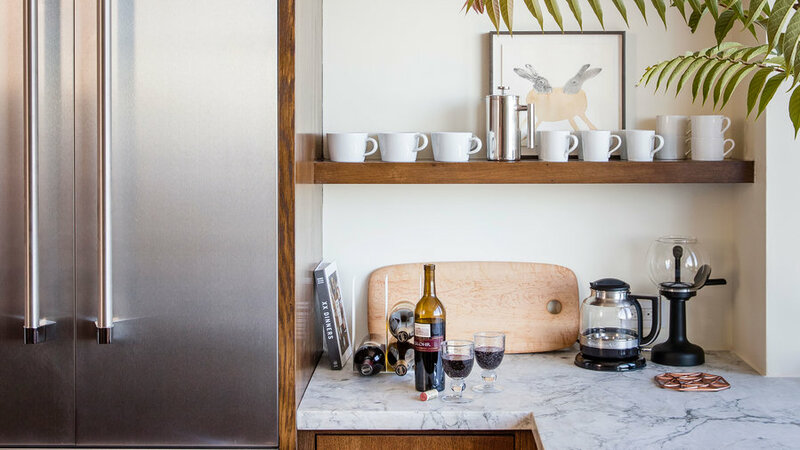 The marble countertop extends to form a backsplash. for Bird & Pomegranate wallpaper by William Morris, $199/roll. for Ventura dining table, $1,180; pair of ladder-back dining chairs, $119. ($196/roll), ($230/roll), and ($15/sq. ft.) are Lauren Geremia's top choices for covering a wall. 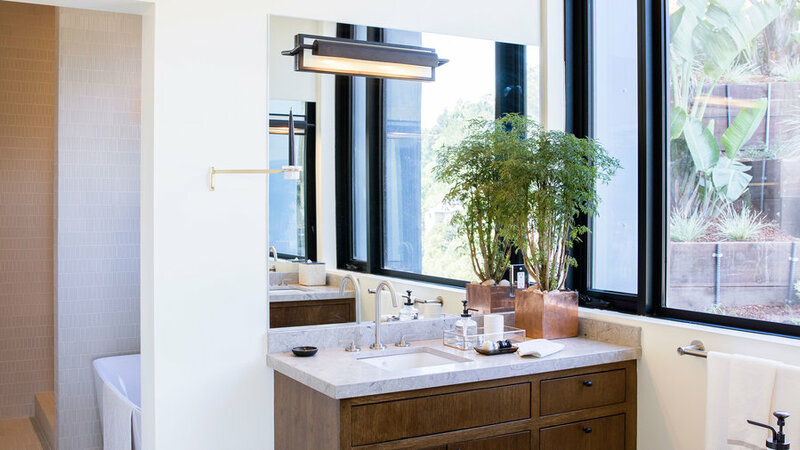 The inset oak cabinetry is a nod to the area’s early 20th-century Craftsman homes; the organically shaped brass hardware supplies the oomph. wine. syrups. for Potato cabinet knobs, from $36. Lauren Geremia favors these products for adding chic touches to your kitchen: for Large oval knob, from $11; for Midvale pull, from $36; for Fairview crystal knob, from $18; and for Lew’s Hardware bar pull collection, from $7.90. In the master bedroom, custom millwork provides ample storage and masks exposed columns alongside the bed. for: Murray platform bed, $240; Wayborn Furniture Benfu armoire, $720; Coyuchi bedding, from $38. for Vintage Jens Risom chairs. for Hawley side table, $2,475. for vintage rug. for Dhow Sheer drapery. for Brasscloth wallpaper in Pyrite, $32/sq. ft.
A long narrow bathroom is outfitted with back-to-back vanities that give its users distinct spaces. 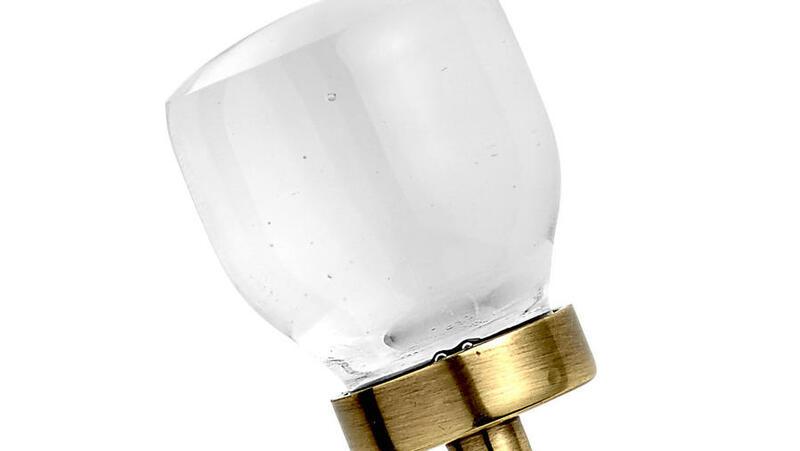 The trick to getting this right, says ­Nebolon, is offsetting the sinks. for Classic Field tile in Natural White, 1x3 and 3x9 from $22. for Mila wall sconces, $205. for Limestone countertops. for Pop Grande square under-counter bathroom sink, $325. for Potato cabinet pulls, from $36 each. Art played a vital role in every room, adding warmth and offbeat character. The designers chose a mix of nature-based photography, warm pencil sketches, and oversize pieces from Western artists including Berkeley-based , Meagan Donegan, Jessica Niello-White, Tammy Rae Carland, Lena Wolff, and John Chiara. “Art is often our starting point. It brings soul to a space and can even inspire a color palette,” says desiner Lauren Geremia. , , , and are but some of Geremia's recommended sources for pieces. 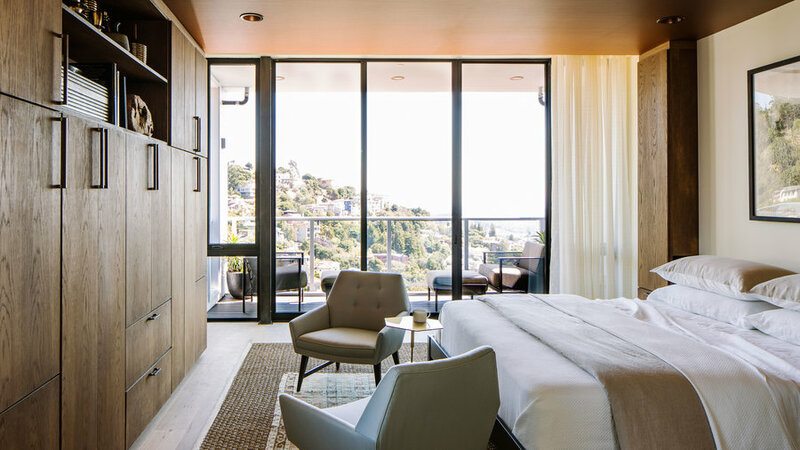 A guest room should feel like a getaway for visitors. 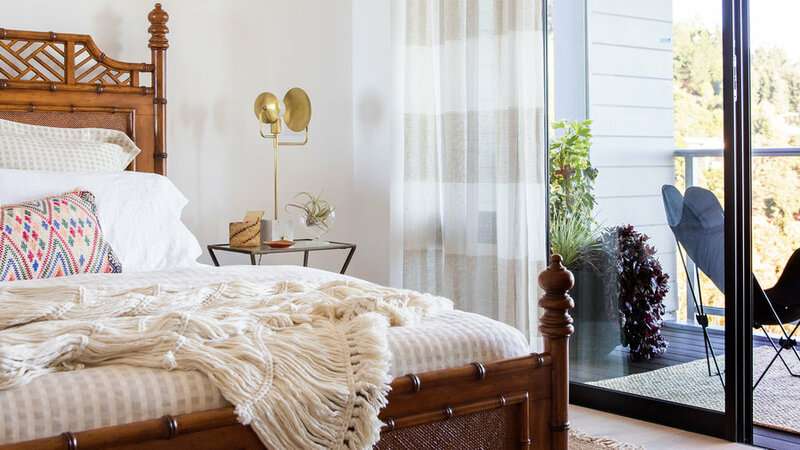 Geremia gave this one a vacation vibe by layering an island-style bed frame with a mostly quiet mixture of patterns and textures. . for Santorini Tinos linen drapery. for Workstead’s Orbit Table Lamp One, $1,350. for Oushak overlay rug. for Downbridge lamp, $129. for: Tommy Bahama Island Estate West Indies bed in Bamboo, $3,949; Coyuchi linens from $38; Interlude Norha side table, $882; Surya jute natural living area rug, $575; Antique White Linen occasional chair, $1,074. 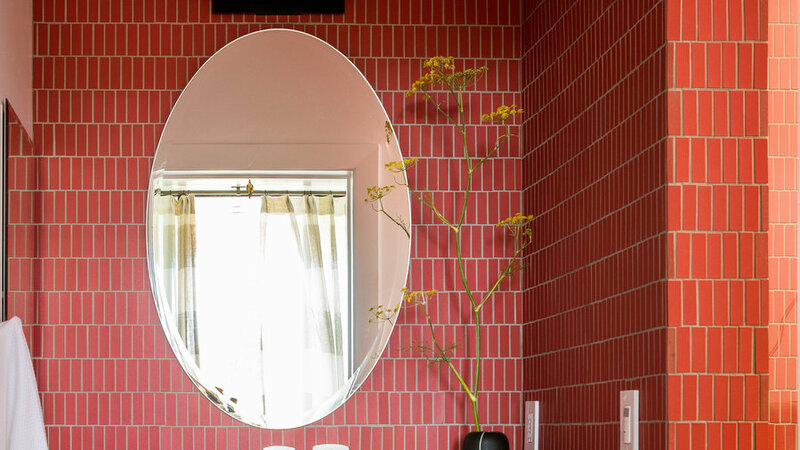 By simply applying the tiles vertically in this small bathroom, the designers created the illusion of height. for Classic Field tile in Paprika in 1x3 and 3x9, from $30/sq. 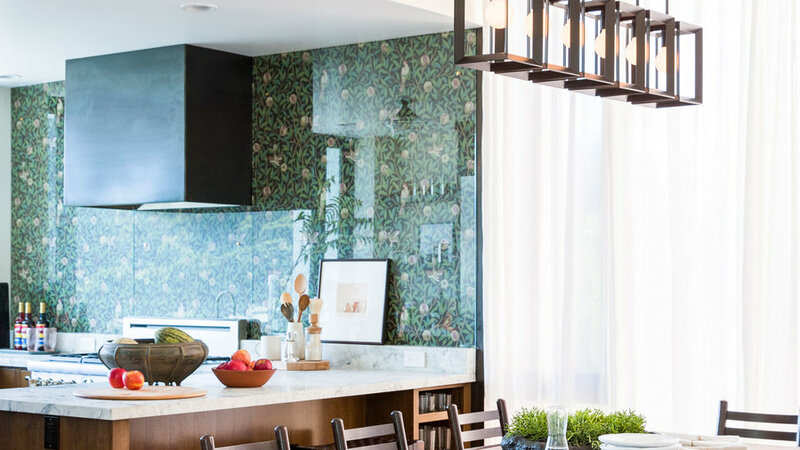 ft.
Lamps can sometimes fade into the background, but in this house, Geremia chose a mix of contemporary and salvaged pieces that command attention. 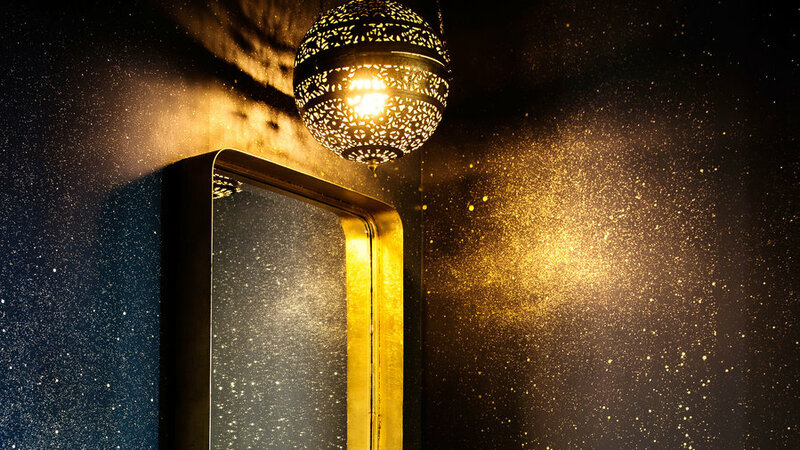 The hanging fixture and gold-splattered wallpaper make this powder room feel like a glam galaxy. . for Cosmos wallpaper in Elikonas, $45/sq. ft. for Lyndon single-handle faucet, $565. 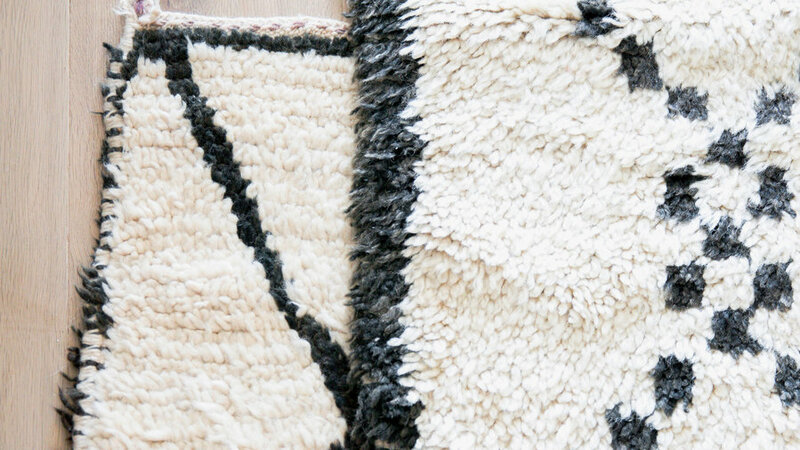 Layering rugs sets a casual, slightly bohemian tone and provides extra padding underfoot. To master the look, O’Brien recommends overlaying rugs with a similar shag and pattern, or placing a small, patterned rug over a larger one made of a natural material, such as sisal or jute. for Vintage rugs pictured here. The designers made this media room kid- and red wine–friendly by embracing indoor-outdoor fabric—using it on the cushions, sofa, curtains, even the wall. for custom sofa. for custom floor cushions. fabric in Heritage Moss and Connect Dune, $40/yard. Nebolon wrapped the six decks in glass, allowing light to “pass into the interiors as much as possible,” he says. 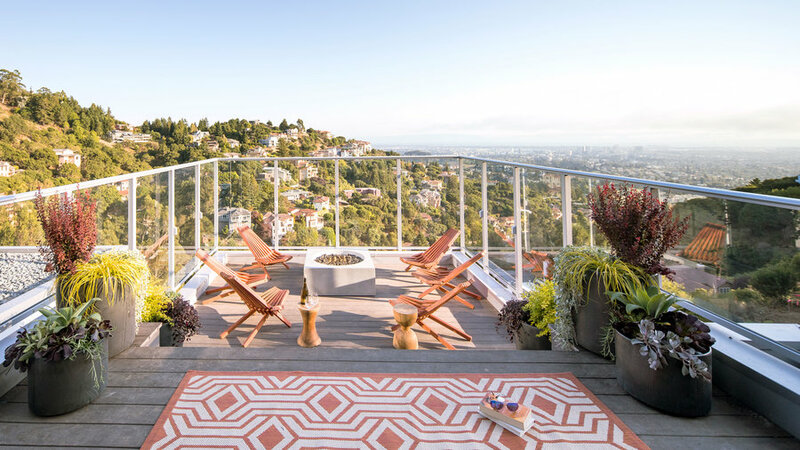 The AZEK deck, which looks similar to hardwood, reinforces the indoor-outdoor connection, while large-scale potted plants bring additional greenery into view. for plant retailers. Vintage Collection deck in Dark Hickory. Drawing inspiration from an M.C. 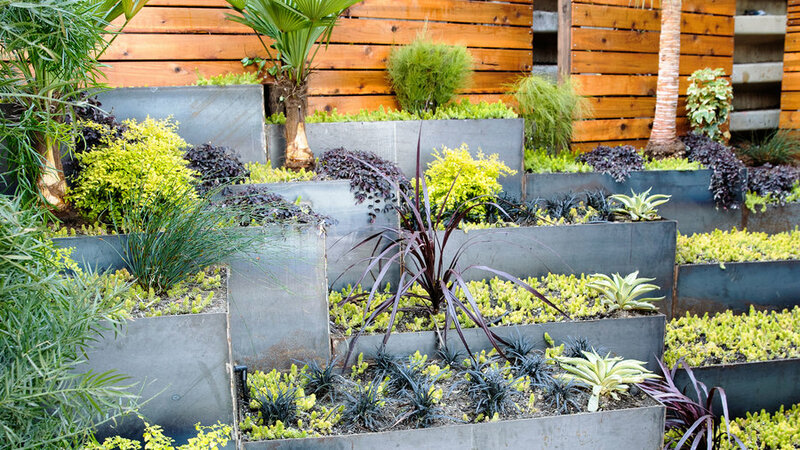 Escher sketch, landscape designers Michelle Derviss and David Feix planted a geometric garden into the hillside, filling steel planters with succulents, low-water perennials, and palms.